Distraction osteogenesis, also termed callotasis, callus distraction, and osteodistraction, is the surgical technique of generating new bone by progressive stretching of divided segments. Following its introduction, distraction osteogenesis gained immediate interest and has been widely performed in the maxillofacial complex. A crude method of distraction osteogenesis first appeared in the literature in 1905 and was described by Codivilla, who used the technique to elongate a femur. Distraction osteogenesis of the mandible is shown in the image below. Distraction osteogenesis of the mandible. Alveolar distractor used to increase the height of the alveolar bone. Courtesy of K.L.S. Martin, LP. In 1992, McCarthy reported a series of 4 young patients (average age, 78 mo) who successfully underwent gradual distraction of the mandible without grafting, transfusion, or intermaxillary fixation. Early in the history of this procedure, distraction osteogenesis of the mandible involved using bulky external distractors. Although these external distractors still have a place in certain applications, a wide variety of intraoral internal distractors are now available; these distractors are small and compact, with increased patient comfort and acceptance. Distraction osteogenesis is now a feasible treatment option for adults and children with unilateral or bilateral mandibular hypoplasia. It is a treatment option for widening an excessively narrow mandible. Distraction osteogenesis is also a treatment alternative for the management of airway obstruction (eg, obstructive sleep apnea [OSA]), continuity defects of the mandible, reconstruction after a resection, and alveolar crest augmentation. Mandibular retrognathia is one of the most common craniofacial deformities; approximately 10% of the population have significant dental overjet. Mandibular retrognathia can be congenital or acquired. Congenital causes include hemifacial microsomia, Treacher Collins syndrome, Pierre Robin syndrome, Goldenhar syndrome, Nager syndrome, and mandibular hypoplasia. Acquired causes of mandibular retrognathia include trauma (ie, condylar fractures occurring at an early age and resulting in bony ankylosis or disrupted growth) and previous surgery for developmental cysts or tumors. Although less common than retrognathia, the mandible can also exhibit a transverse deficiency, resulting in a severe malocclusion and anterior dental crowding. This condition is difficult to correct with traditional osteotomies, and multiple extractions are often necessary. Distraction osteogenesis of the mandible has become a commonplace procedure with the flexibility to allow the surgeon to address a wide variety of mandibular defects. Approximately 10% of the population has significant dental overjet. Craniofacial defects amenable to treatment with distraction osteogenesis are not highly prevalent. It is estimated that OSA affects 12 million people in the United States. After a low power osteotomy is performed, distraction osteogenesis begins with the formation of a hematoma between and around the bone segments. The hematoma is converted to a clot, and bone necrosis occurs at the end of the fracture segments. An ingrowth of vasoformative elements and capillaries for the restoration of blood supply forms a soft callus. Tension is then applied to the soft callus and a dynamic microenvironment is created. Pluripotential mesenchymal cells are activated into fibroblasts and osteoblasts, and type I collagen is laid down parallel to the vector of distraction. Bony trabeculae grow into the fibrous area from the periphery, parallel to the line of tension that occurs during the distraction phase. A bridge of immature bone forms across the distraction gap. A poorly mineralized, radiolucent fibrous interzone is located in the middle of the distraction gap, where the influence of tensional stress is maximal. The interzone functions as the center of fibroblast proliferation and fibrous tissue formation. During the consolidation phase, bony remodeling begins. The regenerate eventually matures into osseous tissue similar to the native bone. Ilizarov’s study proved that the success of the distraction depended on the rate and rhythm of the force applied on site. The optimal rate of distraction is often reported to be 1 mm/day. Although the majority of authors agree with the distraction rate of 1 mm/day, there are reports suggesting different rates. Chin and Toth applied a distraction rate of up to 3 mm/day and Ramichel et al reported establishing a rate of 2 mm/day. [3, 4] However, distraction of more than 1.5 mm/day may cause delayed ossification or pseudoarthrosis due to local ischemia in the interzone. In their study of 39 patients, Meyer et al reported one failure, defending the approach of setting the rate on a case-by-case basis considering individual variables. A rate of distraction of 0.5 mm or less per day may cause premature consolidation of the bone. Soft tissue also has the ability to grow linearly along lines of tension. This is referred to as distraction histogenesis. Skin, muscle, nerves, and vascular tissue are generated, not stretched. The advantage is obvious, especially for severe retrognathia, in which the stretched soft tissue envelope can contribute to relapse when a traditional mandibular osteotomy is performed for a large (>10 mm) advancement. Distraction osteogenesis has many advantages over traditional mandibular osteotomies, as delineated below. Distraction osteogenesis decreases the need for bone grafting for large (>10 mm) mandibular advancements; one can achieve 20 mm or more of advancement without a bone graft and the associated donor site morbidity, scarring, and potential for infection. The procedure can be performed in infants and children, who would otherwise not be candidates for mandibular osteotomy because of the interference with the developing tooth buds and/or insufficient bone to safely perform a traditional osteotomy. In addition, distraction osteogenesis often has obviated the need for a tracheotomy in newborns and infants with micrognathia and airway obstruction. This procedure also results in less distortion and loading of the temporomandibular joint than sagittal split osteotomy. Distraction osteogenesis can be performed in 3 dimensions, that is, advancing, widening, and increasing vertical height of the basal mandibular bone. In addition, the vector and the amount of movement can be tailored to each patient, especially in those with significant facial asymmetry. Distraction osteogenesis can be used to rotate the anterior portion of the mandible to correct open bites related with mandibular deficiencies. Greater patient acceptance exists with this procedure, especially with the development of low-profile intraoral devices. Distraction osteogenesis appears to have a decreased potential for relapse, especially with large advancements; this is because the transported portion experiences a progressively increased movement, instead of being transported in one large block. Due to the process of distraction histogenesis, resistance to advancement by the soft tissue envelope is decreased. Distraction osteogenesis seems to limit the likelihood of damaging the inferior alveolar nerve. Widening the mandible, which is difficult to do with traditional osteotomies and presents multiple complications, is possible with distraction osteogenesis. Bone grafts are not required; hence, there is no donor site morbidity. Patients with severe OSA (respiratory disturbance index [RDI] >60) and patients who are obese (body mass index [BMI] >28). The mandible is a U-shaped bone. It is the only mobile bone of the facial skeleton, and, since it houses the lower teeth, its motion is essential for mastication. It is formed by intramembranous ossification. The mandible is composed of 2 hemimandibles joined at the midline by a vertical symphysis. The hemimandibles fuse to form a single bone by age 2 years. Each hemimandible is composed of a horizontal body with a posterior vertical extension termed the ramus. Placement of the osteotomy depends on the desired vector of distraction. However, certain anatomic structures must be avoided. The osteotomy is best placed either anterior or superior to the mandibular angle; the angle is maintained and the flattening of that portion of the patient's face is prevented. Tooth roots or developing teeth must be avoided when performing the osteotomy or placing the distraction device screw fixation. When the osteotomy is performed, the inferior alveolar nerve must also be avoided. Care must be taken to avoid damaging the lingual nerve when one extends the osteotomy through the lingual aspect of the mandible where the nerve lies in close proximity. For more information about the relevant anatomy, see Facial Bone Anatomy. Patients who are unable or unwilling to comply with the distraction schedule are not ideal candidates for this procedure. Mandibular distraction osteogenesis has been performed on infants as young as 9 days old,  but more difficulty is encountered when dealing with small fragile bones in the placement of the distraction device, especially children under 6 years of age. In older patients, a decreased number of mesenchymal stem cells may impair bone healing at the distraction site. Patients who have metal allergies are not ideal. Ilizarov GA, Ledyaev VI. The replacement of long tubular bone defects by lengthening distraction osteotomy of one of the fragments. 1969. Clin Orthop Relat Res. 1992 Jul. 7-10. [Medline]. McCarthy JG, Schreiber J, Karp N, Thorne CH, Grayson BH. Lengthening the human mandible by gradual distraction. Plast Reconstr Surg. 1992 Jan. 89(1):1-8; discussion 9-10. [Medline]. Tibesar RJ, Price DL, Moore EJ. Mandibular distraction osteogenesis to relieve Pierre Robin airway obstruction. Am J Otolaryngol. 2006 Nov-Dec. 27(6):436-9. [Medline]. González-García R, Naval-Gías L, Rodríguez-Campo FJ. Distraction osteogenesis in the irradiated mandible for segmental mandibular reconstruction. J Oral Maxillofac Surg. 2009 Jul. 67(7):1573-4. [Medline]. Meyer U, Kruse-Lösler B, Wiesmann HP. Principles of bone formation driven by biophysical forces in craniofacial surgery. Br J Oral Maxillofac Surg. 2006 Aug. 44(4):289-95. [Medline]. Hong P, Boyd D, Beyea SD, Bezuhly M. Enhancement of bone consolidation in mandibular distraction osteogenesis: a contemporary review of experimental studies involving adjuvant therapies. J Plast Reconstr Aesthet Surg. 2013 Jul. 66(7):883-95. [Medline]. Hong P. A clinical narrative review of mandibular distraction osteogenesis in neonates with Pierre Robin sequence. Int J Pediatr Otorhinolaryngol. 2011 Aug. 75(8):985-91. [Medline]. Saulacic N, Zix J, Iizuka T. Complication rates and associated factors in alveolar distraction osteogenesis: a comprehensive review. Int J Oral Maxillofac Surg. 2009 Mar. 38(3):210-7. [Medline]. Hwang SJ, Jung JG, Jung JU, Kyung SH. Vertical alveolar bone distraction at molar region using lag screw principle. J Oral Maxillofac Surg. 2004 Jul. 62(7):787-94. [Medline]. Rachmiel A, Srouji S, Peled M. Alveolar ridge augmentation by distraction osteogenesis. Int J Oral Maxillofac Surg. 2001 Dec. 30(6):510-7. [Medline]. Clark CL, Strider J, Hall C, Ferguson HW, Armstrong KL, Runner RR. Distraction osteogenesis in irradiated rabbit mandibles with adjunctive hyperbaric oxygen therapy. J Oral Maxillofac Surg. 2006 Apr. 64(4):589-93. [Medline]. Costantino PD, Friedman CD. Distraction osteogenesis. Applications for mandibular regrowth. Otolaryngol Clin North Am. 1991 Dec. 24(6):1433-43. [Medline]. Pereira MA, Luiz de Freitas PH, da Rosa TF, Xavier CB. Understanding distraction osteogenesis on the maxillofacial complex: a literature review. J Oral Maxillofac Surg. 2007 Dec. 65(12):2518-23. [Medline]. Cho BC, Kim JY, Lee JH, Chung HY, Park JW, Roh KH. The bone regenerative effect of chitosan microsphere-encapsulated growth hormone on bony consolidation in mandibular distraction osteogenesis in a dog model. J Craniofac Surg. 2004 Mar. 15(2):299-311; discussion 312-3. [Medline]. Ashinoff RL, Cetrulo CL Jr, Galiano RD, Dobryansky M, Bhatt KA, Ceradini DJ. Bone morphogenic protein-2 gene therapy for mandibular distraction osteogenesis. Ann Plast Surg. 2004 Jun. 52(6):585-90; discussion 591. [Medline]. Freddo AL, Hübler R, de Castro-Beck CA, Heitz C, de Oliveira MG. A preliminary study of hardness and modulus of elasticity in sheep mandibles submitted to distraction osteogenesis and low-level laser therapy. Med Oral Patol Oral Cir Bucal. 2012 Jan. 17(1):e102-7. [Medline]. Kreisner PE, Blaya DS, Gaião L, Maciel-Santos ME, Etges A, Santana-Filho M. Histological evaluation of the effect of low-level laser on distraction osteogenesis in rabbit mandibles. Med Oral Patol Oral Cir Bucal. 2010 Jul. 15(4):e616-8. [Medline]. Chiapasco M, Consolo U, Bianchi A, Ronchi P. Alveolar distraction osteogenesis for the correction of vertically deficient edentulous ridges: a multicenter prospective study on humans. Int J Oral Maxillofac Implants. 2004 May-Jun. 19(3):399-407. [Medline]. Robiony M, Toro C, Stucki-McCormick SU, Zerman N, Costa F, Politi M. The "FAD" (Floating Alveolar Device): a bidirectional distraction system for distraction osteogenesis of the alveolar process. J Oral Maxillofac Surg. 2004 Sep. 62(9 Suppl 2):136-42. [Medline]. Mazzonetto R, Allais M, Maurette PE, Moreira RW. A retrospective study of the potential complications during alveolar distraction osteogenesis in 55 patients. Int J Oral Maxillofac Surg. 2007 Jan. 36(1):6-10. [Medline]. Zheng LW, Wong MC, Rabie AB, Cheung LK. Evaluation of recombinant human bone morphogenetic protein-2 in mandibular distraction osteogenesis in rabbits: Effect of dosage and number of doses on formation of bone. Br J Oral Maxillofac Surg. 2006 Dec. 44(6):487-94. [Medline]. Kim IS, Park JW, Kwon IC, Baik BS, Cho BC. Role of BMP, betaig-h3, and chitosan in early bony consolidation in distraction osteogenesis in a dog model. Plast Reconstr Surg. 2002 May. 109(6):1966-77. [Medline]. Jiang X, Zou S, Ye B, Zhu S, Liu Y, Hu J. bFGF-Modified BMMSCs enhance bone regeneration following distraction osteogenesis in rabbits. Bone. 2010 Apr. 46(4):1156-61. [Medline]. Cho BC, Moon JH, Chung HY, Park JW, Kweon IC, Kim IS. The bone regenerative effect of growth hormone on consolidation in mandibular distraction osteogenesis of a dog model. J Craniofac Surg. 2003 May. 14(3):417-25. [Medline]. Gateno J, Seymour-Dempsey K, Teichgraeber JF, Lalani Z, Yanez R, Xia JJ. Prototype testing for a new bioabsorbable Le Fort III distraction device: a pilot study. J Oral Maxillofac Surg. 2004 Dec. 62(12):1517-23. [Medline]. Cohen SR, Holmes RE. Internal Le Fort III distraction with biodegradable devices. J Craniofac Surg. 2001 May. 12(3):264-72. [Medline]. Goldwaser BR, Magill J, Papadaki ME, Byl M, Kromann R, Yates B. Continuous mandibular distraction osteogenesis: novel device and preliminary results in minipigs. J Oral Maxillofac Surg. 2013 Apr. 71(4):e168-77. [Medline]. Peacock ZS, Tricomi BJ, Murphy BA, Magill JC, Kaban LB, Troulis MJ. Automated continuous distraction osteogenesis may allow faster distraction rates: a preliminary study. J Oral Maxillofac Surg. 2013 Jun. 71(6):1073-84. [Medline]. Alkan A, Ozer M, Bas B, Bayram M, Celebi N, Inal S. Mandibular symphyseal distraction osteogenesis: review of three techniques. Int J Oral Maxillofac Surg. 2007 Feb. 36(2):111-7. [Medline]. Azumi Y, Sugawara J, Takahashi I, Mitani H, Nagasaka H, Kawamura H. Positional and morphologic changes of the mandibular condyle after mandibular distraction osteogenesis in skeletal class II patients. World J Orthod. 2004 Spring. 5(1):32-9. [Medline]. Block MS, Brister GD. Use of distraction osteogenesis for maxillary advancement: preliminary results. J Oral Maxillofac Surg. 1994 Mar. 52(3):282-6; discussion 287-8. [Medline]. Breuning KH, van Strijen PJ, Prahl-Andersen B, Tuinzing DB. Duration of orthodontic treatment and mandibular lengthening by means of distraction or bilateral sagittal split osteotomy in patients with Angle Class II malocclusions. Am J Orthod Dentofacial Orthop. 2005 Jan. 127(1):25-9. [Medline]. Chin M, Toth BA. Distraction osteogenesis in maxillofacial surgery using internal devices: review of five cases. J Oral Maxillofac Surg. 1996 Jan. 54(1):45-53; discussion 54. [Medline]. Clark CL, Strider J, Hall C, Ferguson HW, Armstrong KL, Runner RR, et al. Distraction osteogenesis in irradiated rabbit mandibles with adjunctive hyperbaric oxygen therapy. J Oral Maxillofac Surg. 2006 Apr. 64(4):589-93. [Medline]. Delloye C, Delefortrie G, Coutelier L, Vincent A. Bone regenerate formation in cortical bone during distraction lengthening. An experimental study. Clin Orthop Rel Res. 1990. 250: 34-42. Douglas P. Sinn, DDS, Wichit Taranon, DDS. Three-Dimensional Planning for Mandibular Distraction Osteogenesis in Hemifacial Microsomia Patients: Prediction Tracing and Results. [Full Text]. Eski M, Turegun M, Deveci M, Gokce HS, Sengezer M. Vertical distraction osteogenesis of fibular bone flap in reconstructed mandible. Ann Plast Surg. 2006 Dec. 57(6):631-6. [Medline]. Fritz MA, Sidman JD. Distraction osteogenesis of the mandible. Curr Opin Otolaryngol Head Neck Surg. 2004 Dec. 12(6):513-8. [Medline]. Grayson BH, McCormick S, Santiago PE, McCarthy JG. Vector of device placement and trajectory of mandibular distraction. J Craniofac Surg. 1997 Nov. 8(6):473-80; discussion 481-2. [Medline]. Guerrero CA, Bell WH, Gonzalez M. Intraoral distraction osteogenesis. Oral and Maxillofacial Surgery. Fonseca RJ, ed. Philadelphia: WB Saunders Co; 2000. Vol 2: 380-402. Gugenheim JJ Jr. The Ilizarov method. Orthopedic and soft tissue applications. Clin Plast Surg. 1998 Oct. 25(4):567-78. [Medline]. Helman JI, Cottrell K, Garetz R. Outcome assessments in the surgical management of obstructive sleep apnea. Zurich, Switzerland: International Symposium on Problems and Complications in Corrective Surgery of Facial Skeletal Anomalies. University of Zurich; 2003. Hollier LH Jr, Higuera S, Stal S, Taylor TD. Distraction rate and latency: factors in the outcome of pediatric mandibular distraction. Plast Reconstr Surg. 2006 Jun. 117(7):2333-6. [Medline]. Imola MJ. Craniofacial Distraction Osteogenesis. Medscape Reference Journal [serial online]. 2003. Available at: http://emedicine.medscape.com/article/844659-overview. [Full Text]. Janette AJ, Vicari FA, Baurer BS. Treatment of upper airway obstruction secondary to mandibular deficiency by distraction osteogenesis [abstract presentation]. American Association of Oral and Maxillofacial Surgeons. 1995. Kunz C, Adolphs N, Buescher P, Hammer B, Rahn B. Distraction osteogenesis of the canine mandible: the impact of acute callus manipulation on vascularization and early bone formation. J Oral Maxillofac Surg. 2005 Jan. 63(1):93-102. [Medline]. Malkoç S, Iseri H, Karaman AI, Mutlu N, Küçükkolbasi H. Effects of mandibular symphyseal distraction osteogenesis on mandibular structures. Am J Orthod Dentofacial Orthop. 2006 Nov. 130(5):603-11. [Medline]. McCormick SU. Facial asymmetry. The diagnostic challenge. Atlas Oral Maxillofac Surg Clin North Am. 1996 Mar. 4(1):1-18. [Medline]. McCormick SU, Grayson BH, McCarthy JG, Staffenberg D. Effect of mandibular distraction on the temporomandibular joint: Part 2, Clinical study. J Craniofac Surg. 1995 Sep. 6(5):364-7. [Medline]. McKibbin B. The biology of fracture healing in long bones. J Bone Joint Surg. 1978. 60-B: 150-162. Molina F, Ortiz Monasterio F. Mandibular elongation and remodeling by distraction: a farewell to major osteotomies. Plast Reconstr Surg. 1995 Sep. 96(4):825-40; discussion 841-2. [Medline]. Ortakoglu K, Karacay S, Sencimen M, Akin E, Ozyigit AH, Bengi O. Distraction osteogenesis in a severe mandibular deficiency. Head Face Med. 2007. 3:7. [Medline]. Ortiz Monasterio F, Molina F, Andrade L, Rodriguez C, Sainz Arregui J. Simultaneous mandibular and maxillary distraction in hemifacial microsomia in adults: avoiding occlusal disasters. Plast Reconstr Surg. 1997 Sep. 100(4):852-61. [Medline]. Paley D, Tetsworth K. Mechanical axis deviation of the lower limbs. Preoperative planning of uni-apical angular deformities of the tibia or femur. Clin Orthop Rel Res. 1992. 280: 48-64. Paterson D. Leg-lengthening procedures. A historical review. Clin Orthop Relat Res. 1990 Jan. 27-33. [Medline]. Rachmiel A, Aizenbud D, Pillar G, Srouji S, Peled M. Bilateral mandibular distraction for patients with compromised airway analyzed by three-dimensional CT. Int J Oral Maxillofac Surg. 2005 Jan. 34(1):9-18. [Medline]. Rachmiel A, Jackson IT, Potparic Z, Laufer D. Midface advancement in sheep by gradual distraction: a 1-year follow-up study. J Oral Maxillofac Surg. 1995 May. 53(5):525-9. [Medline]. Sayan NB, Karasu HA, Uyank LO. Two-stage treatment of TMJ ankylosis by early surgical approach and distraction osteogenesis. J Craniofac Surg. 2007. 18(1):212-7. Snyder CC, Levine GA, Swanson HM, Browne EZ Jr. Mandibular lengthening by gradual distraction. Preliminary report. Plast Reconstr Surg. 1973 May. 51(5):506-8. [Medline]. Stucki-McCormick SU, Fox RM, Mizrahi R. Distraction osteogenesis: a unique treatment for congenital micrognathias. Fonseca RJ, ed. Philadelphia: WB Saunders Co; 2000. 347-58. Taylor TD, Stal S. Applications of distraction osteogenesis. Part I. Clin Plast Surg. 1998 Oct. 25(4):553-60, viii. [Medline]. Thompson SH, Quinn M, Helman JI. In press. Maxillomandibular distraction osteogenesis advancement for the treatment of OSA, a case report. Tucker MR. Management of severe mandibular retrognathia in the adult patient using traditional orthognathic surgery. J Oral Maxillofac Surg. 2002 Nov. 60(11):1334-40. [Medline]. Waanders NA, Herzenberg JE, Goulet JA. A morphologic study of the regenerate bone structure in the early stages of distraction osteogenesis. Bull Hosp Joint Dis Orthop Inst. 1992. 52(1). Walker DA. Management of severe mandibular retrognathia in the adult patient using distraction osteogenesis. J Oral Maxillofac Surg. 2002 Nov. 60(11):1341-6. [Medline]. Yasui N, Kojimoto H, Sasaki K, Kitada A, Shimizu H, Shimomura Y. Factors affecting callus distraction in limb lengthening. Clin Orthop Rel Res. 1993. 293: 55-60. Yasui N, Kojimoto H, Shimizu H, Shimomura Y. The effect of distraction upon bone, muscle, and periosteum. Orthop Clin North Am. 1991 Oct. 22(4):563-7. [Medline]. Yonezawa H, Harada K, Ikebe T, Shinohara M, Enomoto S. Effect of recombinant human bone morphogenetic protein-2 (rhBMP-2) on bone consolidation on distraction osteogenesis: a preliminary study in rabbit mandibles. J Craniomaxillofac Surg. 2006 Jul. 34(5):270-6. [Medline]. Distraction osteogenesis of the mandible. 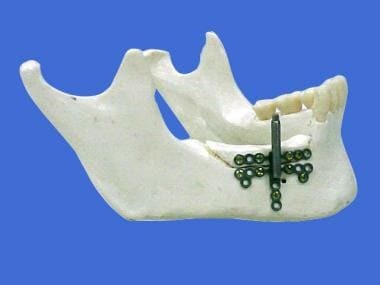 A reciprocating saw is used to osteotomize inferior, lateral, and superior portions of the mandible. An osteotome is then used to complete the bony cut. Courtesy of Jordan Mastrodonato, MS, Medical Illustrator, Eisenhower Army Medical Center. Distraction osteogenesis of the mandible. Intraoral distraction device in place. Courtesy of K.L.S. Martin, LP. Mandibular distractor used for maxillomandibular advancement for the treatment of OSA. Courtesy of K.L.S. Martin, LP. Disclosure: consultant for: Checkpoint Surgical llc. Disclosure: Serve(d) as a director, officer, partner, employee, advisor, consultant or trustee for: Checkpoint Surgical LLC.